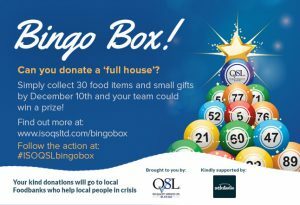 Will your team take up our Bingo Box Challenge to collect 30 food items for your local Food Bank before December 10th? As well as making our own donation to Hamper Scamper to say thank you to our customers, we’re running a competition to encourage other businesses to collect items for their local Food Banks. Simply collect 30 food items to get a ‘full house’ on our Bingo Box card and you could win a prize. It’s the ideal way to get your team working together to help others this Christmas and we’d appreciate your support. Even if you can’t manage a full card, you can use the Bingo card to give you some ideas for what you could donate. You can find out more here and you can follow the action on social media. Visit us on Twitter @ISOQSL and look out for tweets using the hashtag #ISOQSLbingobox. We’d love to see how you are getting on so please do tweet if you’re taking part! Many thanks for any help you can give to make Christmas better for others.